"Many African towns and cities face a range of hazards, which can best be described as representing a “spectrum of risk” of events that can cause death, illness or injury, and impoverishment. Yet despite the growing numbers of people living in African urban centres, the extent and relative severity of these different risks is poorly understood. This paper provides a rationale for using a spectrum of methods to address this spectrum of risk, and demonstrates the utility of mixed‐methods approaches in planning for resilience. It describes activities undertaken in a wide‐ranging multi‐country programme of research, which use multiple approaches to gather empirical data on risk, in order to build a stronger evidence base and provide a more solid base for planning and investment. It concludes that methods need to be chosen in regard to social, political economic, biophysical and hydrogeological context, while also recognising the different levels of complexity and institutional capacity in different urban centres. 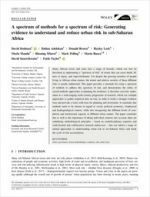 The paper concludes that as well as the importance of taking individual contexts into account, there are underlying methodological principles – based on multidisciplinary expertise and multi‐faceted and collaborative research endeavours – that can inform a range of related approaches to understanding urban risk in sub‐Saharan Africa and break the cycle of risk accumulation." Environment and Urbanization (2017), "Understanding the full spectrum of risk in urban areas", Vol 29, No 1, available at https://journals.sagepub.com/toc/eaua/29/1.